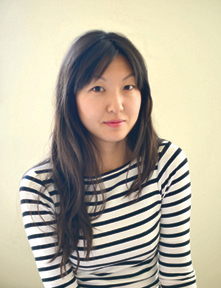 Maurene Goo will be at Teen Book Fest on Saturday, Oct. 12 on the Keepin' It Real panel in Meeting Room A at 2pm and the Make 'Em Laugh panel in Meeting Room A at 2pm. 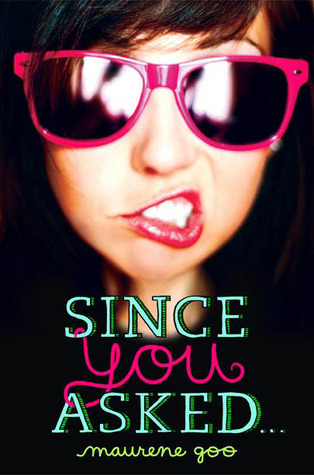 Maurene will be signing copies of Since You Asked at 4pm in Meeting Room B.
Maurene Goo is the author of Since You Asked, that rarest breed of YA contemporary fiction that has PG-rated content, but bad girl cred to spare. And on top of all that, it's funny, too! Holly Kim didn’t set out to be a rebel. Up until her sophomore year, she was perfectly happy to make average grades, hang out with her three best friends, and hope that no one else noticed her. But behind her quiet, mild facade, Holly has a subversive side that finds an outlet when her snarky rewrite of a fellow newspaper staffer’s column is accidentally published. It gets people’s attention, and Holly lands a monthly column for The Weasel Times (yes, her school has a horrific mascot). Suddenly, Holly is forced into the spotlight, but her newfound fame at school isn’t without controversy. Some people treat her like a folk hero, while others are annoyed that a non-popular nobody like Holly is sounding off about the stupidity of Homecoming courts and Valentine’s Day. And nothing Holly does seems to live up to the expectations of her strict Korean American parents. However, the more Holly steps out into the world, the more she begins to realize that there’s more than meets the eye to many of the targets of her scorn, and there's another side of every story - even her mother’s. 1. How would you describe your teenage years, and how much do your memories of life then influence what you write about today? AKA How much time did you spend in detention? I was a total goody two-shoes average teen. The only rebellious streak I had was talking back to my mother, and even that was REALLY pushing it. In Since You Asked, my main character Holly is very similar to me - terrified of getting in trouble, but kind of rebellious in her own head. My life back then revolved around my friends, I just always always wanted to hang out with them. I can safely say that friendship is the main focus of everything I write, I wouldn't have survived high school, college, adulthood without them! 2. You have 24 hours to show someone a perfect day in Los Angeles. Where would you take them? I am an Eastsider through and through so this will be very East-centric: The morning would start with brunch because LA has the best brunch spots. Preferably a delicious rice bowl with pesto and a poached egg or a fat slice of brioche toast from Sqirl in Silver Lake. Then we'd do a little shopping around there (Dream Collective, Hemingway & Pickett, Broom Street General Store being some of my favorites), before heading to Echo Park for a walk around the newly renovated pond. When it gets hot late afternoon, we'll stop by a Koreatown spa and get a scrub down and enjoy the various pools (we have to be naked, though, so can't be shy about that!). While in K town we'd grab a shaved ice treat, patbingsu, at one of the many amazing coffee shops. Then, right as the sun is about to set, we'd head north to Los Feliz to the Griffith Observatory - the most beautiful, magical spot in LA. We'd watch the sun set over the entire city. Dinner would a quick bite at a taco truck (carne asade please) before heading towards the Hollywood Bowl to catch a show (ANY show - it's the perfect venue). We'd miss the opening band, but everyone's always late in LA ;) We'd drive home with the windows down, sunroof open, listening to the Drive soundtrack. 3. If you were a character in a zombie movie, what would happen to you? I would not turn into a damn zombie, that's for sure. They are SO SLOW, you can literally JOG AWAY from them! I would like to think I'd be the mayor of my survivalist colony, ruling over it with a kind but firm authority. If I got killed, it would be by some lowlife desperate human type wanting to steal my water, not a zombie eating my brains. 4. What is a book that inspired you when you were a teen? And what's the best teen book you've read lately? As a teen, I was deeply inspired by To Kill a Mockingbird - not to be a writer, but to be a better human. I think about that book all the time as an adult. And a great teen book I've read recently is Lydia Kang's CONTROL, a sci-fi which comes out this winter. It is SO good, everyone's in for a treat! To learn more about Maurene, visit http://www.maurenegoo.com/.